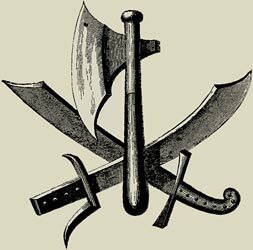 The pole axe was a weapon which consisted of a broad, short axe blade mounted on a wooden shaft, or pole, which was between 4 and 5 feet long. The name of this weapon is derived from the word 'pollaxe' from old English word "head axe" - they were originally an axe mounted on a pole. The hache bore an edged, axe shaped cutting blade on the front side with a small hammer head or curved spike on the back. The hache also featured a long rectangular or diamond cross-sectioned spike at the top of the shaft. The Medieval times were an extremely violent era in history featuring battles in both Europe and the Holy Land when the crusades, and the crusaders who fought them, were numerous. Feudal Lords and Knights and their men at arms used such weapons as the Medieval Pole Axe in different types of warfare. The quest for power led to invasions of lands and territories which had to be fought for. Siege warfare, waged to win a castle or a walled town or city, was a frequent occurrence during the Medieval times. Warfare during the Medieval era called for a variety of weapon expertise. Knights and men-at-arms (who consisted of foot soldiers or archers) used different types of weapons. The Medieval Pole Axe was predominantly used by a Foot Soldier. The weapons used were dictated according to status and position. The weapons, armor and horse of the Knight were extremely expensive - the fighting power of just one knight was worth 10 ordinary soldiers. Langets were added to strengthen this type of weapon. These were metal strips riveted to the the shaft of polearms to reinforce the torque against the head, and to provide protection to the potentially weak point between the weapon-head and the shaft. Blacksmiths are usually associated with making weapons in a village smithy but Medieval blacksmiths were also an important part of a fighting army, making new weapons and repairing and the maintenance of old weapons. The Medieval Life and Times website provides interesting facts, history and information about the weapons, armor and battles in Medieval history, including the Pole Axe, which scatter the history books. The Medieval Times Sitemap provides full details of all of the information and facts about the fascinating subject of the lives of the soldiers and knights who lived during the historical period of the Middle Ages. The content of this article on Pole Axe provides free educational details, facts and information for reference and research for schools, colleges and homework for history courses and history coursework.